Armenians have been on the up and up as of late: the country is hosting ever more events aimed at building the future and focused on faith and love, on peace and prosperity. In addition to a number of official events dedicated to the Centennial of the Armenian Genocide, in 2015 Yerevan hosted an incredibly energetic concert by System of a Down, which left a great impression on young and old alike. Exactly one year later, the inaugural Aurora Prize Ceremony took place in the capital, and Marguerite Barankitse became its first laureate. And now, a new and exciting visit — this time by Pope Francis. This is not the first time Armenia had the honor of hosting the Pope. In 2001, the elderly John Paul II also came to Yerevan, but his age and frail health, exacerbated by the travel, prevented him from reaching Gyumri, where everything was ready for Mass. 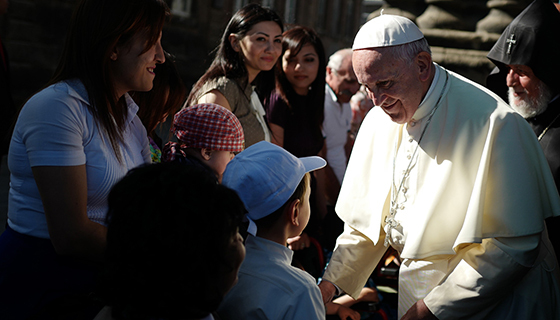 Fortuntely, Pope Francis did make it to Gyumri, where he conducted a liturgy. But for me, the emotional apogee of the Pope’s visit to Armenia was the joint prayer for peace he led on Saturday, June 25 at Yerevan’s Republic Square, together with the Catholicos of All Armenians Karekin II. The stage, from which the head of the Armenian Apostolic Church and the Pope offered their prayers, stood in the very same spot that hosted a monument to Vladimir Lenin until 1991. Security guards speaking in several languages and camera crews from international TV channels surrounded the stage. As I looked at the square bisected by the red carpet I remembered my grandfather, architect Mark Grigoryan, who was responsible for the square’s present-day appearance. My grandfather used to compare its proportions to Rome’s Piazza San Pietro, and I thought that the likeness wouldn’t escape the Pope. I would be very interested in learning about his impressions. Have you noticed that the presence of a great man changes the atmosphere around him? When Martiros Saryan entered the halls of his museum, the room suddenly appeared full of people. He would simply take up all the space with the greatness of his talent. As soon as the Pope appeared on the square, a ringing silence took hold. The 80-year-old Pope looked visibly tired as he made his way. He blessed the people with an almost mechanical gesture of his right hand, looking at thousands of exuberant faces that he was seeing for the first and, most likely, the last time. He climbed the stairs to the stage with the uncertainty of a person whose knees ache. He sat down and froze, as if gathering his strength. The crowd held its breath. No one dared break the silence. Then Pope Francis approached a small pulpit and began his sermon. He spoke in Italian, and the translation was broadcast on huge screens installed around the square. It wasn’t just a sermon. These were philosophical reflections on the past and the future, on memory and its wounds, on love and conflict. Francis did not raise any questions; instead, he answered them in accordance with Christian values. His sermon was not about abstract ideas. It addressed very specific issues: Armenian-Turkish relations, of the conflict in Nagorno-Karabakh and Armenia itself. No one expected him to be so specific, but the details were surprisingly suitable for the occasion, and as he spoke it became difficult to imagine that he could speak of anything else. “We would all benefit from efforts to lay the foundations of a future that will resist being caught up in the illusory power of vengeance, a future of constant efforts to create the conditions for peace: dignified employment for all, care for those in greatest need and the persistent battle to eliminate corruption,” said the Pope, and the people at Republic Square gave him an ovation. Following the people’s lead, members of the government and of parliament also began to applaud. The Pope quoted some of the most important fragments of the book in full: “Remember [Lord,] those of the human race who are our enemies as well, and for their benefit accord them pardon and mercy… Do not destroy those who persecute me, but reform them; root out the vile ways of this world, and plant the good in me and them” (Book of Lamentations, 83, 1-2). Francis also quoted the Gospel of Mathew: “Blessed are the peacemakers for they will be called the sons of God” (Mt 5^9). The translation of the sermon that appeared on the screens wasn’t always readable, but the essence of the speech was clear even without it – just as clear as the enormous positive charge emanating from the elderly man dressed in white who stood on the stage. When, after the ceremony, the Pope approached a group of wheelchair-bound people and kissed every one of them, even I, an unsentimental man, could not hold back tears. I realized, of course, that they were brought there for the photo-op, but I saw happiness illuminate their faces. It was a very special moment, and I was happy for these people, happy along with them.